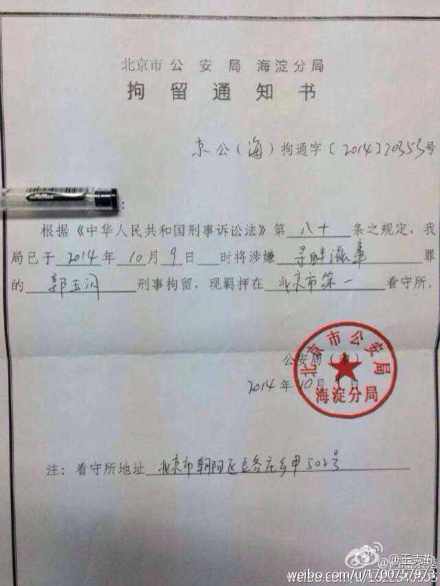 The post, which includes an image of the Notice of Detention (拘留通知书) for legal activist Guo Yushan (郭玉闪), who was detained on October 9, simply reads: “Guo Yushan charged with picking quarrels and causing trouble” (郭玉闪被寻衅滋事). A large number of similar posts sharing the news of Guo’s detention were shared on Chinese social media over the weekend, most of them removed by censors. Guo becomes the latest in a string of detentions and arrests of prominent dissidents in China, including former CMP fellow Pu Zhiqiang. Wang Keqin currently has more than 657,000 followers on Weibo.